The simulator platform of Simwave was successfully upgraded in the first week of October. The unique features and capabilities of the Simwave simulators are able to answer all the requests from the market: from basic training on all ship-borne activities to fulfilling the most extreme expectations and research questions from customers. With the unique capacities of the Kongsberg simulators, strengthened with the innovations from Simwave specialists, the possibilities are unlimited. With the upgrade and the specific tools for any training and research question, Simwave gives answers to the market and opens new approaches in training and research. Making this known to the market in a total SimWay concept is the next step in the assistance to the maritime market from port to pilots, from governments to maritime officers, from tug masters to inland water captains. Since Simwave became operational at the beginning of 2018 many products have been made. From course material and hundreds of scenarios to areas, ports and vessels. Our experts designed models which have already proven to be 100% correct in the real behaviour of the vessel. Behaviour described often with “six degrees of freedom” but also models where all impact from external forces from tow lines, pushing-tugs, fenders, ship-to-ship manoeuvres, shorelines, bank effects, interaction, and squat have their effect on the behaviour of the vessel. The models are used for training and for applied research. Also over the last months, the design of visual databases of ports, coastlines and rivers has been executed very successful and clients satisfaction with the products is outstanding. The images for the bridge simulators (deep sea, rivers barges, tugs, and other vessels) and offshore simulators are also available for promotion for the companies and for applied research activities for new ports and other areas. The new features, some invented by Simwave experts like lock doors, ramps, fenders, and moving ship bridges, enable total ship management and manoeuvring. The unique approach with connecting ship bridges and engine rooms for the same scenario and the same ships, up to 5 full mission bridges in one scenario and the connecting engine rooms make complex operations and the execution of vessel resource management possible. The limitations are now more than ever in the fantasy and vision of the maritime companies. The exploration of the capacities, also for calamity training and crisis management including risk analysis, is the beginning of a new approach of the ship as a system. Apart from available training for working with the “sulphur cap” the use of a minimum of fuel for maximising sailed miles and tasks, can be trained in the simulators of Simwave. A unique connection of simulators, engine room, and bridge, the vessel team learns and experiences to optimise the use of energy. The ship-as-a-system approach pays off and reduction of costs of fuel is the objective of the specific training and indirectly give follow up to the public demand for environmental less damage. 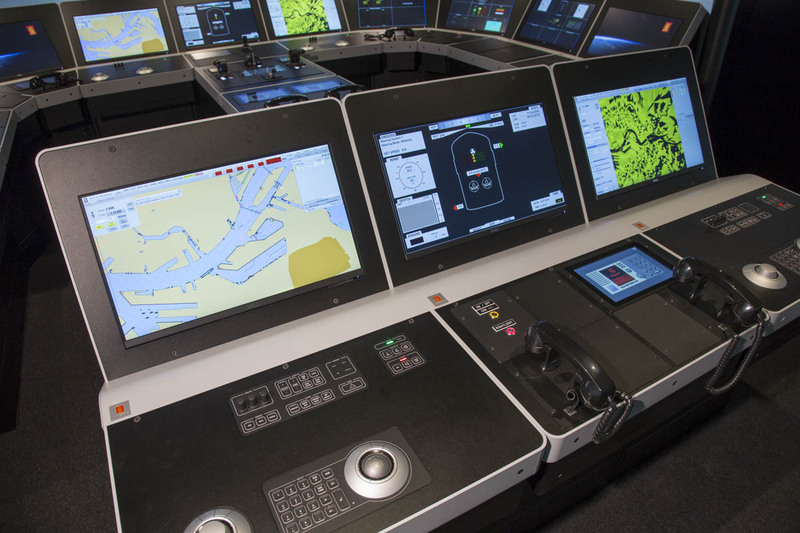 Also for the inland water transport, the engine room simulator and bridge simulator can be connected to train the vessel management team. The optimal use of different fuel, the use of LNG, gasoil, heavy fuel with high sulphur or low sulphur can be explained and experienced with the simulators. The combination in a vessel resource management training for bridge team and engine room team at the same vessel/simulators is a future orientated and innovative approach to high-end training.